The Longform guide to audacious heists. Visitors to the Louvre look at the Mona Lisa, which was stolen in 1911. The robbers had a helicopter, explosives, and inside information on a $150 million cash repository. But the police were on to them—sort of. “The helicopter had been hovering above the building, with a view of the roads surrounding the depot and of the spectators taking in the scene. When the men reemerged at the atrium, the pilot guided the chopper back down to the roof. Two of the robbers dragged several sacks out using hand-sewn straps and set about pulling them up the ladder; the third hauled his sacks up using a rope with a carabiner affixed to the end. At the top, the men piled the sacks into the back of the waiting aircraft. “The robbers had been in the building for 24 minutes, and now they were straining to port their take, most of it in heavy packs of 500 kronor bills, down and up two ladders. One slipped and cut himself, and his blood dripped onto the bottom step. Then, almost precisely 30 minutes after they landed, the men retreated, abandoning bags of cash at the base of the ladder as they scaled up to the chopper. They grabbed the last of their haul from the roof and jumped in. The moment the doors clicked shut, the helicopter lifted off. “The London robbery was soon followed by dozens of other Pink Panther heists, in Europe and in Asia; the take from these robberies approached a quarter of a billion dollars. In March, 2004, Panthers targeted a jewelry store in Tokyo. Two Serbs, wearing wigs, entered the store and immobilized a clerk with pepper spray. They made off with a necklace containing a hundred-and-twenty-five-carat diamond. That same year, in Paris, Panthers exploited a visit to Chopard by the wife of Prime Minister Jean-Pierre Raffarin, and stole fourteen million dollars’ worth of jewels from an unguarded display case. In 2005, a Panther team, dressed in flower-print shirts, raided Julian, a jewelry store in Saint-Tropez. The heist, which took place in broad daylight, lasted just minutes. The thieves ran out of the store and down to the harbor, where they escaped in a waiting speedboat. “In frustration, detectives in London, Paris, Brussels, Geneva, and Tokyo, working through the international police agencies Interpol and Europol, began pooling information about the Panthers. DNA data, fingerprint scans, telephone numbers, and other evidence were checked against Interpol databases, and against two maintained by Europol, Mare Nostrum and Furtum. The effort has begun to pay off. Perhaps two dozen Panthers are now imprisoned in Western Europe. But the gang continues to operate—the Panthers are suspected in a recent hit on the Chaumet shop in Paris—and none of its senior members have agreed to cooperate with the police. Seven years after the Graff heist, the exact nature of the Pink Panthers’ organization and operational structure remains a mystery. Looking for closure in the only unsolved skyjacking case in history. “On September 29, the night before the crime, Curcio couldn’t sleep. He got out of bed at 5:30 A.M. before Emily and his girls awoke. Just watching them sleep peacefully, he wanted to quit, to not go to the bank, to be the old Anthony again. He felt his throat constrict and began to cry. He hated what he was about to do. Hated what he’d become. But it was too late. The planning had taken over. By now he had already placed the Craigslist ad looking for landscapers, and that, for him, was the final step. The unemployed guys were going to be there soon, and the armored car would follow. Game time. How $100 million in diamonds, gold and jewelry disappeared from Antwerp Diamond Center’s supersecure vault. “Notarbartolo leans toward me in the Belgian prison and asks if I have any questions so far. It is a rare break in his fast-moving monologue. There is a sense of urgency. He is allotted only one hour of visiting time per day. “’You’re telling me that the heist was organized by an Antwerp diamond dealer,’ I say. 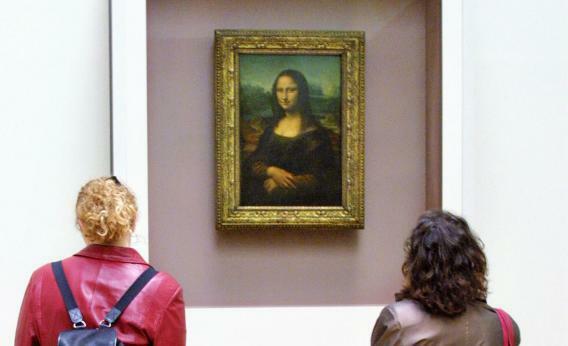 Was the 1911 theft of the Mona Lisa from the Louvre actually a smokescreen? “Down the stairs came one of the Louvre’s plumbers, named Sauvet. Later, Sauvet—the only person to witness the thief inside the museum—testified that he had seen only one man, dressed as a museum employee. The man complained that the doorknob was missing. Apparently thinking that there was nothing strange about the situation, Sauvet produced a pliers to open the door. The plumber suggested that they leave it open in case anyone else should use the staircase. The thief agreed, and the two parted ways. “The door opened onto a courtyard, the Cour du Sphinx. From there the thief passed through another gallery, then entered the Cour Visconti, and—perhaps trying not to appear in a hurry—headed toward the main entrance of the museum. Few guards were on duty that day, and only one was assigned to that entrance. As luck would have it, the guard had left his post to fetch a bucket of water to clean the vestibule. He never saw the thief, or thieves, leave the building.